Matthew Alexander, born in 1953, has a well established reputation as a renowned and leading contemporary British landscape painter. 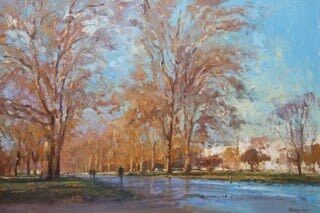 He demonstrates a mastery of technique that easily rivals the Modern British painters such as Edward Seago and therefore places him as one of the country's finest landscape painters. His father Chris Alexander (1926-82) the noted artist and lecturer has been the main influence on his painting. In the summer of 1981 he left the security of the teaching profession and became a self-employed artist. He was soon exhibiting his paintings in many of the major galleries in the South of England and encouraged by strong demand for his work began to submit to major exhibitions in London including the Royal Academy Summer Exhibition, The Royal Watercolour Society, The Royal Institute of Oil Painters and The Royal Society of British Artists to which he was elected a member in 1985. The artist has a focused approach to his work saying, 'as a landscape painter my senses are stirred by the landscape I am in or travelling through. It is the light and shadow, the sun or the cloud patterns - my concern is to express impressions from all my senses and to try to give form to them in purely visual terms’. His paintings are included in private, public and corporate collections throughout the world.